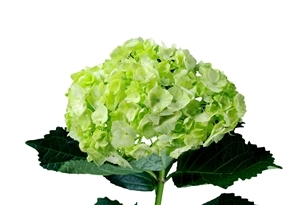 50 stems of high quality wholesale Hydrangea. Shades of blue can vary due to seasons. Hydrangea will add bold, beautiful color and excitement to any arrangement. A very popular wedding flower, the hydrangea is a four-petaled flower that grow in flower heads that are 4"-8" wide. •Average stem length is 22-24"
Ordering as early as possible is best. We work best when we have at least 7-10 days to arrange for delivery but we can often work to meet your schedule. If you need an order right away, we can usually fulfill the order. We recommend that you have your hydrangea delivered 1-2 days prior to your event. This will give the flower ample time to hydrate and absorb nutrients. It will be at the peak of its beautiful life around the third day for your event. Bulk hydrangea is available year round. •Flower you receive may vary slightly from pictures above. Flowers are a product of mother nature and it is not an exact science. We do guarantee that you will receive the most beautiful and magnificent htdraangea available on the market. •Your flowers may look dehydrated and tired, when you first receive them. This is normal. Please refer to flower care above. Your Calla Lillies will be shipped dry and not in water. Experts prepare your flowers for their journey beforehand with plenty of nutrients and water. You're flowers may look dehydrated and droopy/tired. Do not get frustrated. This is completely normal. Simply follow the step below and your flowers will bloom absolutely beautifully in no time at all. 1. Upon arrival, remove flowers from box and cut 1/2" - 1" diagonally from the bottom of each stem. 2. Place flowers in a container with about 4" of water. Hydrangea should be hydrated using cool temperature water. 3. Remove any dark/fading petals. It is normal to find unattractive petals. 4. Add flower food or preservative to the water. This will prevent bacteria from forming in the water, and will also give the flower proper nutrients it requires to look the absolute best it can. 6. It is important that you change the water, and re-cut the bottom of the stems of your flowers every 24-48 hours. Every day is best. Note: Very important to change water every day and to put flower preservative in the water to prevent bacteria from forming the the flowers drinking water. We recommend receiving your hydrangea 2-3 days before your event. This will give the flowers ample time to hydrate. They will be be at the peak of their life, and look absolutely stunning 2-3 days from when you receive them.